An Emotional Support Animal (ESA) is a pet that has been prescribed to patients who have a mental disorder. ESAs can only be prescribed by a certified therapist, psychiatrist, and psychologist to help people cope with their emotional needs. Aside from offering its owner the emotional support they need to get through the day, ESAs more or less behave like regular pets. This is why owners are likely to become attached to their pets and can’t afford to spend time away from them even when they have to board a plane or have to leave the country. The good news is that ESAs can travel onboard for free as long as you have a certified letter from a professional psychologist or therapist. However, the airline must be contacted at least 48 hours before the scheduled departure time and must be presented with a certified letter. This will provide the airline representatives enough time to call the doctor’s office and verify the authenticity of the letter. So, if you fail to call in advance, don’t be surprised if you are not allowed to board with your pet. The Air Carrier Access Act (ACAA), folks who have been diagnosed with a mental disability and have obtained a letter from a certified mental health professional are allowed to travel with an ESA on air. If all the requirements are fulfilled, the airlines are not legally allowed to cross-question or ask questions regarding the person’s disability. This law also protects ESA owners from being charged an additional fee because of their pet as long as all the requirements have been met. If an airline refuses to comply, you can get in touch with the Customer Resolution Official (CRO) and report the problem immediately. However, make sure you have a certified letter to testify your illness before contacting the authorities. There are certain considerations that you need to keep in mind before calling up the airlines. 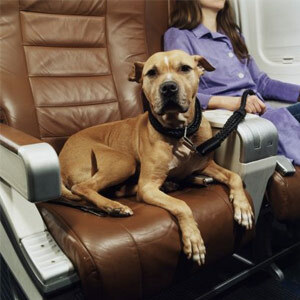 First off, note that pets that are not well-behaved or are excessively loud will not be allowed to board the plane. Animals that possess a threatening nature can be legally denied service. Additionally, if your ESA is a big furry dog that is too large to sit on your lap, an airline representative may request you to seat the animal on the floor. Most airlines don’t have a problem with small animals that can easily fit inside a crate or carrier. While most American airlines allow pets that weigh larger than 25 pounds to travel with their owners, this might not apply to foreign carriers. It is thus important you call the airline in advance and ask them questions regarding your pet. Additionally, be prepared for setbacks. You may experience skepticism regarding your need for an ESA from passersby, and that’s alright. Having a certified ESA letter is an excellent way to clear any doubts that people may have. Additionally, be respectful to other people who might not understand your situation. Keep your cool and always call an airline in advance before you book your flight. Additionally, ensure the letter is not nearing its expiry date before flying. You will not be protected by the ACAA once the letter has expired so ensure you have everything you need to travel with your furry friend onboard.